Clear up space and clear out old paints, solvents and electronics ahead of the holidays. And don't miss the new location. E-CARE, Arlington’s big clean-out and drop-off day, happens Saturday, Nov. 17, in a new location: 1425 N. Quincy St., across from Washington-Lee High School and the David M. Brown Planetarium. The free, biannual “Environmental Collection and Recycling Event” runs 8:30 a.m. to 1 p.m., rain or shine. 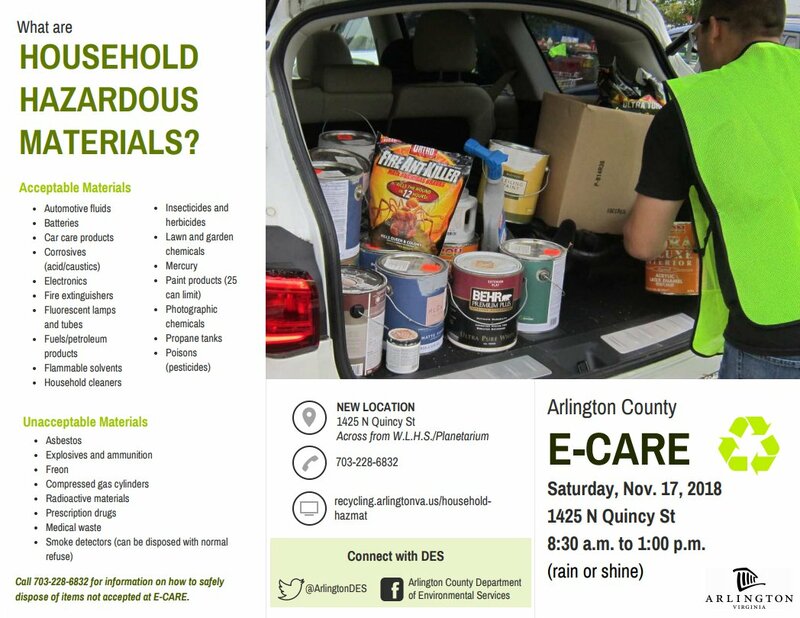 Coming just ahead of the holidays, E-CARE will help Arlington households free up space by providing safe disposal of old hazardous materials like paint, pesticides, motor oil and solvents; devices containing mercury; fluorescent bulbs; plus electronics, batteries, fire extinguishers and propane tanks. Take advantage of small metal recycling for items like pots and pans, tools and venetian blinds. Give new life to old bicycles, which are fixed and shipped overseas for use as basic, reliable transportation. 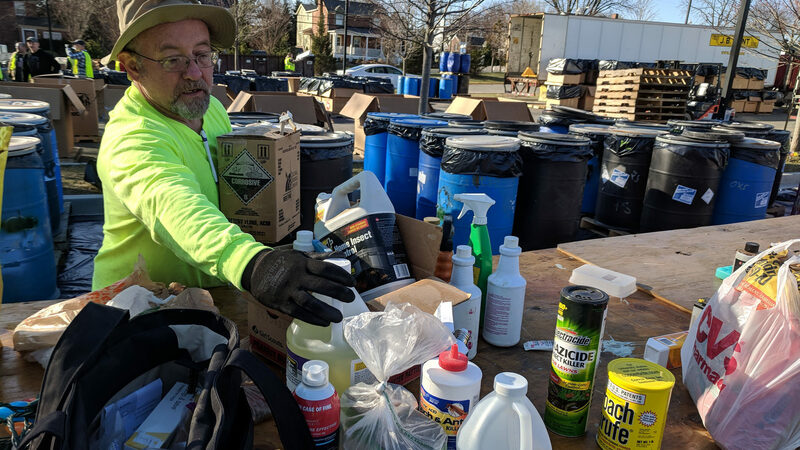 The County’s spring E-CARE recycling and disposal event, held in March, collected 88,728 pounds of household hazardous materials and 24,770 pounds of used electronics. Keeping with the theme of a cleaner Arlington and world, check with neighbors in advance to combine loads and reduce the total number of trips to the site. E-CARE is an officially listed America Recycles Day (Nov. 15) event. When possible, place all drop-off materials in the original containers or label them clearly. Leaking containers should be inside an extra protective layer. A fee is required only to dispose of older, bulkier televisions ($20) and computer monitors ($15) containing cathode ray tubes. Cash or checks only — made payable to “Arlington County Treasurer.” Disposal of all other screen and monitor types is free. A $10 tax-deductible donation to “Bikes of the World” is requested per bicycle to cover shipping costs. Commercial and medical waste, asbestos, explosives and similar materials will not be accepted. Smoking is strictly prohibited at the drop-off site. To make unloading faster, pack vehicles in reverse order of the on-site E-CARE drop-off route: electronics should go in first, household hazardous materials next, then lastly and most accessible — metals and bicycles. Police will be on North Quincy Street to help residents access and exit the drop-off site from the northbound lane only. Bring ID to confirm work or residency in Arlington. Arlington maintains a year-round household hazardous materials/electronics drop-off at the Water Pollution Control Plant on South 31st Street, open most Saturdays and by appointment during the week. The County also maintains recycling drop-off centers for paper, cardboard, metal cans, glass and plastics at Quincy Park near Ballston and the Trades Center in Shirlington.